04-Nov-2008 -- On an impulse we bought some cheap remaining tickets on a week's package tour to Cyprus. 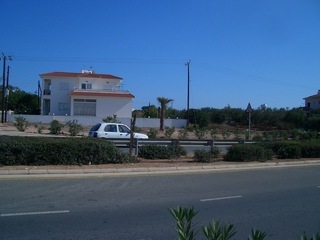 From the beach at Agia Napa and straight north to the confluence point was only just under two kilometers. So the wife and myself headed north for a little walk before lunch. On the way we visited an interesting old monastry and a new church which was also well worth a visit. Most of the way turned out to be climbing a hill; on asphalt. The sun was warm and the speed slow. When we arrived within 100 meters of the cp we realized we were on the wrong side of a motorway. The traffic was surprisingly busy, and as slow and retired people we did not chance darting across. We settled for a visit to the cp at a distance of 39 meters.